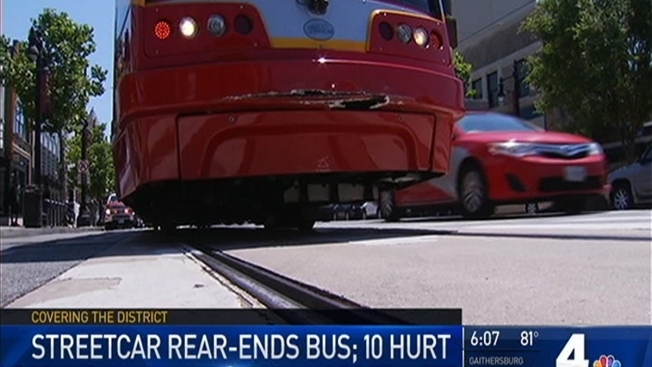 A streetcar rear-ended a Metrobus on H Street in northeast D.C. Friday morning, injuring 10 people on the bus. News4's Chris Gordon reports. A streetcar rear-ended a Metrobus on H Street at 11th Street in northeast D.C. Friday morning, according to Metro. Ten passengers on the bus suffered minor injuries, a D.C. Fire and EMS spokesperson said. "When it hit, we just flew," injured bus passenger Belinda King said. "We're all going to the hospital." "There was a loud crash, and after that, you saw a lot of people really, really hurt and getting off the bus," said Johnny Bay, who manages a store across the intersection. Bay said he saw the streetcar hit the bus. "Definitely the streetcar had the light, but the Metrobus had stopped, you know, and I think there was a car coming out of the parking spot here, and maybe the streetcar didn't see that,” he said. "I was sitting on the back of the bus and all of a sudden I felt a hard bump," injured bus passenger Ralph Martin said. "I thought they were doing something underneath the ground or something, but we got rear-ended by the trolley." Ten passengers were taken to a hospital for treatment. "We called our mass casualty bus considering the number of people that were involved and we transported them to the local hospital," D.C. Fire and EMS Capt. Larry Chapman said. King said the crash cause her to hit a rail on the same side where she had a total hip replacement. There is no word on the extent of damage to the streetcar or bus. The D.C. Department of Transportation, which operates the streetcar, said the driver of the streetcar has been taken out of rotation for alcohol and drug testing. Following years of delays and budget overruns, the D.C. streetcar began operating about 15 months ago, shuttling passengers along a 2.5-mile stretch of H Street NE for free. It set a monthly ridership record in January with more than 92,000 trips. DDOT wants to expand it east to the Benning Road Metro station, which could take about six years and cost about $200 million. Mayor Muriel Bowser eventually hopes to expand the streetcar west into Georgetown.